The arch disrupter of marketing talks culture. Our top rated episode! The author of This is Going To Hurt shares the truth of the job. Maybe having a good work culture is the only sustainable strategy for successful companies. Zeynep Ton explains. Unless we challenge some of the norms of work – how are we ever going to improve it? For too long we’ve allowed self appointed experts to tell us what causes creativity. Now is the time for data. Following the work of Sandy Pentland from MIT, what more can learn about improving work? What does the world’s greatest architect think world will look like in 20 years? How can we build buildings for the future of work? Choose an episode or choose a lesson plan. Find the best way to learn the evidence of improving work – and your team culture. Bruce Daisley interviews psychologists, neuroscientists and work place experts to understand how we can improve our jobs. The series has a focus on science and experts, over gurus and opinions. Suggested content (articles and videos) to share with colleagues to start discussion. 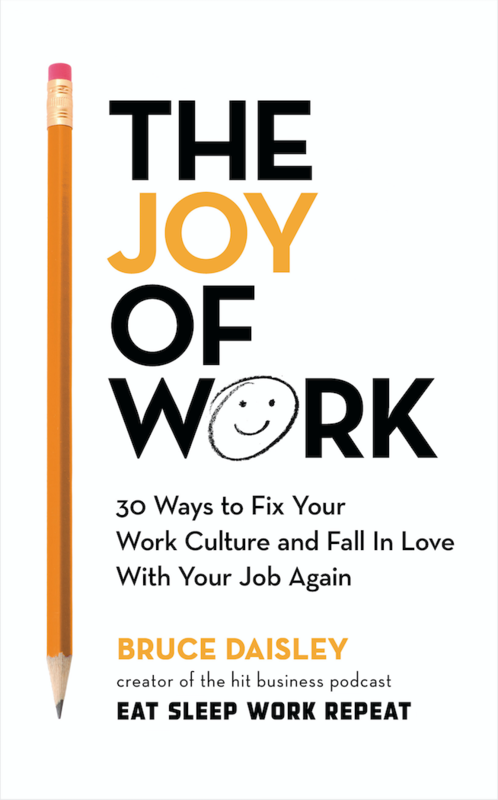 The Joy of Work now available to pre-order. Following the success of Eat Sleep Work Repeat, in January 2019 Penguin Random House are publishing The Joy of Work. 30 scientifically proven ways to improve your work. Lessons to recharge, improve sync and build buzz in your work.